Autofil Bottle Top Filters from Foxx Life Sciences fit perfectly with the media storage bottles to provide a complete filtration system. A disposable, sterile, vacuum operated bottle-top filter system used for the preparation of buffers, tissue culture media, microbiological media and other biological fluids. Foxx Life Sciences' sterile and non-sterile media bottles have been designed specifically for Life Science researchers to store common solutions such as tissue culture media, serum, and buffers. Designed to handle full vacuum and can be used with Autofil filtration system. Polycarbonate bottles are highly transparent, shatterproof, and have good alcohol resistance. They are gamma sterilized and rated to withstand five autoclave cycles (bottle only). PETG bottles are optically clear and offer better impact resistance than polystyrene storage bottles. The bottles are gas impermeable, and are an ideal low cost choice for general laboratory solution storage. Polystyrene bottles are used for general purpose cell culture aqueous solutions. 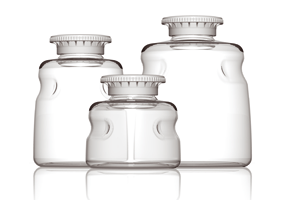 Each Autofil media bottle has features that improve the handling of the bottle, especially when the bottle is wet. The narrow bottle shoulder, combined with the molded finger grips, improves theability to securely grip the bottle with gloved hands. The patented, SECUREgrasp bottle cap enables easy handling and carrying of the bottle. The innovative cap also allows for easy uncapping, tightening, and bottle stacking and provides a large surface for bottle labelling. 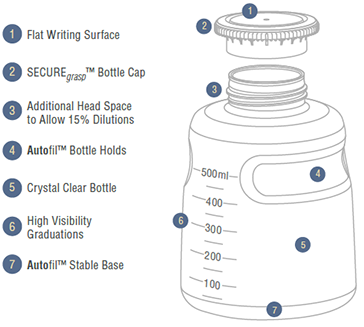 To further discuss the Autofil laboratory media bottle range, and how we can help you. Please contact us, or request a callback at a convenient time to suit you.